CHANDIGARH, July 24  A Division Bench of the Punjab and Haryana High Court comprising Mr Justice H.S. Brar and Mr Justice V. M. Jain by a common judgement dismissed 29 connected writ petitions all involving common questions of law and facts pertaining to unauthorised occupation of land under the command and control of the Air Force Station, Halwara. CHANDIGARH, July 24  All efforts are being made by Bhai Ranjit Singh to make Justice Kuldip Singh (retd) agree to accepting the nomination for the Tarn Taran Lok Sabha seat. JALANDHAR, July 24  A major breakthrough has been achieved by the police here in a financial scam detected in May, 1999, after one of the executive members who had absconded was arrested on July 19. Mr Gaurav Yadav, SSP, stated here today that the police had detected a financial scam in May, 1999. LUDHIANA, July 24  The All-India Shiromani Akali Dal headed by Mr Gurcharan Singh Tohra has decided to field Mr Gurdarshan Singh Grewal, a former Advocate-General of Punjab, from the Ludhiana parliamentary constituency. TARN TARAN, July 24  In a categorical statement sacked Akal Takht Jathedar, Bhai Ranjit Singh, has said he will not campaign for any faction of the Shiromani Akali Dal which enters into a poll alliance with 'anti-Panthic' parties. ROPAR, July 24  Mr Debabratta Biswas, MP and general secretary of the All-India Forward Bloc, today, doubted the intentions of the Union Government with regard to the setting up of the Netaji inquiry commission which was announced on March 25. AMRITSAR, July 24  The DGP Mr Sarabjit Singh, today confirmed that the ISI had failed to recruit fresh crop of terrorists from Punjab. PATIALA, July 24  Mr G.S. Tohra, President, Sarb Hind Shiromani Akali Dal said today that the SAD was fielding rich candidates to woo the voters with the lure of money. NAWANSHAHR: It is healthy and positive sign that now the people have started co-operating with the government to solve their problems, and the desilting of Mehmoodpur drain in Balachaur subdivision to solve the problem of water-logging and floods, is an example as farmers of the area have been provided land free of cost for it. AMRITSAR, July 24  Ms Kiranjot Kaur, executive member, SGPC, has condemned the section of the Sant Samaj for saying that the new Nanakshahi calendar has been prepared at the behest of anti-Sikh agencies. PATIALA, July 24  Water level at RD 460, the syphon which takes the Ghaggar water from below the Bhakra main line canal at Khanauri in Sangrur district, has crossed the danger mark of 753 feet. LUDHIANA, July 24  The police has claimed to have achieved a major success with the recovery of Murli Manohar (6) yesterday from a cow shed at Manekwal village, four days after he was kidnapped from Kehar Singh Nagar on July 19. FAZILKA, July 24  Pesticides dealers of the town and surrounding areas have criticised decision of the Centre Government to enhance licence fee for retailers in an arbitrary manner. 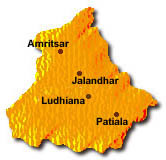 LUDHIANA, July 24  The police has arrested three members of a gang involved in stealing and selling of stray pigs, allegedly for hitting at a police vehicle parked at an octroi post near Jalandhar bypass and then shooting at the police party when they were chased by the police. PATIALA, July 24  The teachers and Parents Association of the local DAV Public School today accused the district administration of trying to hush up the case registered against the former school Principal, Mrs P. Lall, who is presently under suspension. LUDHIANA, July 24  Sant Baba Darshan Singh of Dhakki Sahib, Maksoodaran, was today brought in the court of the Judicial Magistrate First Class, Mr H J S Tiwana, for the first time since his arrest on May 8 and his remand was further extended till July 30. In the writ petitions, Harmohan Singh and others had challenged the orders passed by the Air Officer Commanding, Air Force Station, Halwara, exercising the powers of the Estate Officer under the Public Premises (Eviction of Unauthorised Occupants) Act 1971, which were confirmed in appeal by the District Judge, Ferozepore, whereby the petitioners were ordered to be ejected from the land in question. About 982 acres of land at Ferozepore airfield was permitted to be cultivated by local farmers at Ferozepore by appointing them as farm managers under the 'Grow More Food' scheme of the Government of India. The farm managers so appointed were required to pay a very nominal rent and were permitted to take away the entire proceeds of the yield of the land. The terms and conditions of employment as farm managers were specified in writing and Air Force Station, Halwara, issued entry passes to casual labourers employed in Ferozepore airfield for security reasons. The Government of India decided that the Air Force land was now required for use of military purposes by the Indian Army. The Air Force Station, Halwara, was directed to hand over the land at Ferozepore airfield to the Indian Army. Thereupon, separate show-cause notices under the Public Premises Act, were issued to all petitioners by the Estate Officers Air Force Station, Halwara, terminating the services of the said farm managers, besides asking them to surrender and vacate the land required for operational reasons failing which their possession would be unauthorised and illegal. Since the petitioners did not abide by the above, they were ordered to be evicted, if need be, by the use of such force, as may be necessary. The petitioners challenging the above orders in the High Court contended that the said land was given to them on lease on a year to year basis and that the relationship that existed was of landlord and tenant and not of employer and employee under the designation of farm managers. It was urged that by virtue of being in cultivating possession for 30 years, the petitioners had made substantial investments in the land, dug tubewells, raised permanent structures and could be ejected only under the provisions of the Transfer of Property Act. It was contended that since the Public Premises Act was not applicable, the petitioners could not be termed as unauthorised occupants because they were statutory tenants. In reply, the Union of India stated that there was no lease deed executed between the parties and there was no such lease agreement. Therefore, there was no relationship of landlord and tenant between the parties. As per the policy, defence land could not be given to private parties on lease basis. Only its cultivation could be allowed by appointing farm managers on specified terms and conditions by engaging security cleared private labour. It was further urged that since the government land was required for operational purposes by the Indian Army, the petitioners had no right to occupy the said land required for the purpose of the defence of the country. Being unauthorised occupants of Public Premises, the petitioners were bound to vacate the land owned by Union of India and investments, if any made, were at the petitioners peril and risk. The written terms and conditions of appointment of farm managers clearly prescribed termination of their services without notice or compensation which was duly accepted by the petitioners by written certificates of undertaking agreeing to accept and abide by all those terms and conditions. The Bench after perusing the orders passed by the Estate Officer and the District Judge held that there was no illegality or infirmity in the said orders. The court concluded that the petitioners had failed to show as to how there was a relationship of landlord and tenant between the parties and in what manner the petitioners could be termed as lessees holding over the land in question. The court held that in fact the Air Force authorities were debarred from giving the land in question on lease to any private individual. The petitioners were only allowed to cultivate the land as licensees in their capacity as farm managers. On termination of services as farm managers, the possession of the petitioners was definitely unauthorised. If the land was needed for the purposes of defence, then the security forces could not be asked to stand and wait because some persons were keeping the land owned by the Union of India. Finding no merit, the court ordered dismissal of all the writ petitions. Mr J.S. Gill appeared for the petitioners and the Union of India was represented by Mr Anil Malhotra, Central Government Standing Counsel. Informed sources said here today that Bhai Ranjit Singh held a prolonged meeting with Justice Kuldip Singh at Panchkula in this connection yesterday. Confirming the meeting, the former judge said Bhai Ranjit Singh had talked about the Tarn Taran seat with him. But he had not made up his mind so far. But supporters of Bhai Ranjit Singh are hopeful that Justice Kuldip Singh will agree to be the candidate from Tarn Taran. Bhai Ranjit Singh also held a meeting here yesterday in Sector 35 with Mr Gurcharan Singh Tohra, President, Sarb Hind Shiromani Akali Dal, in this connection. He reportedly told Mr Tohra about the discussion he had with Justice Kuldip Singh. Informed sources said that Bhai Ranjit Singh also wanted to include Mr Simranjit Singh Mann, President of the Shiromani Akali Dal (Amritsar), in the proposed front of various Akali factions and the BSP against Punjab Chief Minister Parkash Singh Badal. The sources said that Bhai Ranjit Singh had expressed his desire to put up Mr Mann as a candidate of the Front for the Sangrur Lok Sabha seat. He also wanted that all factions of the Akali Dals should contest as one force against the candidates of the SAD-BJP combine. The sources added Mr Kuldip Singh Wadala would be the candidate of the Front from Jalandhar Lok Sabha seat. But he has been advised to be the candidate on the condition that he would have to withdraw if Mr I.K. Gujral, a former Prime Minister, expressed his desire to be the Front's candidate from Jalandhar. Bhai Jasbir Singh Rode is expected to be Front's candidate from Faridkot. Meanwhile, Mr Amarinder Singh, a member of the SGPC from Chandigarh, said today that the Delhi Sikh Gurdwara Parbandhak Committee would give Rs 31,000 in Punjab to each family of the jawan who died fighting the enemy in Kargil. JALANDHAR, July 24  A major breakthrough has been achieved by the police here in a financial scam detected in May, 1999, after one of the executive members who had absconded was arrested on July 19. Mr Gaurav Yadav, SSP, stated here today that the police had detected a financial scam in May, 1999, involving Nebula farms Ltd, a finance company operating from Jay Ess Complex, Shastri Market, here and a sister concern of Nebula Group of Companies, after a complaint was lodged by Mr Roshan Lal of Jia Lakha village, Hoshiarpur, with the Economic Offences Wing of Jalandhar police. The complainant had alleged that he had been duped by the finance company of Rs 96,000 which he had deposited with the company with the assurance that the amount would be doubled within three years. However, at the time of maturity of the term of the fixed deposit when the complainant went to the finance company, he was paid neither the promised amount nor the principal he had deposited with the company. The investigation of the case was entrusted to Sub Inspector Harjinder Singh of the Economic Offences Wing under the supervision of Mr Gautam Cheema, IPS. During the investigation it was revealed that Varinder Kochhar had floated a group of companies  Nebula Financial Service Ltd., Nebula Mutual Benefit Society Ltd., Nebula Farms Ltd., Dee and Dee Home Appliances Ltd., Nebula Builders Ltd., Nebula Sales Corporation Ltd., Nebula Computer Centre, Nebula Foundation. All these companies were based at Jay Ess Complex owned by Varinder Kochhar. All accused had absconded and the group of companies closed. However, later the police succeeded in arresting three of the accused, Jiwan Kumar Anand, Suresh Chander Aggarwal and Poonam Prabhakar. The SSP stated that the police had been conducting raids at various places where the accused were suspected to be hiding, including their houses. On July 19 Hem Lata Kochhar w/o Varinder Kochhar, the mastermind behind the scam, walked into the police trap when she tried to sneak into her own house. Varinder Kochhar is a law graduate and worked with a nationalised bank for 13 years from 1980 to 1993. In 1993 he started a business of giving loans at Kapurthala in association with Jiwan Kumar Anand. The business was flourishing as the interest rate was quite high. In 1995 both started the Nebula Group of Companies. With the arrest of Hem Lata Kochhar the police is hopeful of making a headway in the investigation of the case. She was produced in the court and remanded in police custody till July 22. This was announced here today by Mr Tohra. He said Mr Grewal would be supported by other electoral partners of the AISAD, namely the BSP and the MCPI. He said Mrs Balbir Kaur Khalsa, wife of the late party MP, Mr Basant Singh Khalsa, would be the party nominee for the Ropar (reserve) constituency. The candidature of Mr Prem Singh Chandumajra for Patiala has already been announced. Mr Tohra said his party would put up its candidates on eight of the 13 Lok Sabha seats. The BSP would contest three seats, Ferozepore, Phillaur and Hoshiarpur. He was unclear regarding support to Mr Inder Kumar Gujral in the Jalandhar constituency. "Our first choice would be Mr Kuldip Singh Wadala. But if does not contest in view of the keenness on part of Mr Gujral to contest from Jalandhar, we would consider supporting Mr Gujral. Of course, he would have to contest as the Janata Dal nominee and not as the candidate of the BJP or the SAD headed by Mr Parkash Singh Badal." As regards Faridkot, the AISAD would support any candidate put up by Mr Jasbir Singh Rode's outfit. As regard Mr Simranjit Singh Mann, who is said to be flexing muscles for contesting the Sangrur seat, the party was yet undecided. Mr Tohra said he was still in negotiations with CPM supremo, Harkishan Singh Surjeet as regards Sangrur. But if the CPM sought the support of the Congress, the AISAD would not support him. Mr Tohra also announced the names of certain office-bearers of the party in Punjab and other states. Mr Surjan Singh Thekedar would be the acting president of the AISAD. Mr Hazoor Singh would head the party unit in Andhra Pradesh. Mr Pritam Singh Bhopal will be president of the Madhya Pradesh unit, Mr Kewal Singh of the Maharashtra unit, Mr Malkit Singh of the Vidharba unit and Mr Hardyal Singh Dakha of the West Bengal unit. Mr Anoop Rai Singh Gill, Mr Gurbaksh Singh Badani, Dr Inderjeet Singh and Mr Jaswinder Singh would be members of the national council of the party. Baba Ajit Singh would be the president of the beopar cell of the party. Though he did not mention names it is clear that his inference was to the CPI and CPM. He, however, welcomed the alliance of the Sarb Hind Shiromani Akali Dal of Mr Gurcharan Singh Tohra with the Bahujan Samaj Party. "The BSP should be considered as a natural ally of the newly floated Akali faction, as it is a party of poor people", Bhai Ranjit Singh said adding he would take pride in campaigning for BSP candidates if they reached an alliance with the Sarb Hind Shiromani Akali Dal. Before addressing election rallies in this Akali-dominated parliamentary constituency today, Bhai Ranjit Singh told TNS that Mr Tohra had agreed to his proposal that his party would not enter into an alliance with 'anti-Panthic' or 'anti-Akal Takht' political parties. There was a move for seat adjustment between the Communist parties with the Sarb Hind Shiromani Akali Dal. However, Bhai Ranjit Singh said he would undertake a hurricane tour of all constituencies of Punjab to "expose" the alleged 'misdeeds' of Mr Parkash Singh Badal and his party for allegedly denigrating Akal Takht. Bhai Ranjit Singh also had a closed-door meeting with Mr Prem Singh Lalpura, MLA from Tarn Taran who was expelled by the SAD for not taking an oath as Member Parliament after the last Lok Sabha election in protest against the induction of Mr Sukhbir Singh Badal into the Union Ministry by ignoring his seniority in the party. To yet another question, Bhai Ranjit Singh claimed that he still continued to be Jathedar of Akal Takht. He described Giani Puran Singh as 'sarkari jathedar'. The sacked jathedar said Giani Puran Singh, had no locus standi to patronise the World Sikh Council, headed by Justice Kuldip Singh (Retd). He said he was still the patron of the World Sikh Council. Giani Puran Singh could revive the old World Sikh Council (of Prof Manjit Singh) which was already rejected by the Sikh Sangat and the judiciary. Bhai Ranit Singh who has returned from a three-week tour of Germany, Holland, France and other European countries said resolutions were passed in various gurdwaras which accepted him Jathedar of Akal Takht. He said the resolutions passed in these gurdwaras has also described Giani Puran Singh as 'sarkari' jathedar. On the controversial 'Nanakshahi' calendar, Bhai Ranjit Singh said during his stint as Akal Takht Jathedar he had directed the SGPC to constitute a committee of the representatives of Sikh intellectuals and Sikh institutions for making recommendations before its implementations, he said that before the recommendations of all the Sikh institutions the 'Nanakshahi' calendar should not be implemented. Inaugurating a two-day fifth all-India Netaji conference being organised by the Netaji Research Foundation here, Mr Biswas said the delay in the notification of the commission and appointment of its members had created a sense of suspicion among the followers of Netaji Subhas Chandra Bose and they felt that the government was not sincere in setting up the inquiry panel. Mr D.B. Kalmankar, Chairman, Karnataka Legislative Council, said a large number of people believed that Netaji had not died in the alleged aircrash and even the findings of the two previous inquiry commissions were inconclusive. So the appointment of a third inquiry panel was a necessity to solve the mystery surrounding the death of Netaji, he added. Mr Subratta Bose, a nephew of Netaji, stressed the need to ensure the proper presentation of facts before the proposed inquiry commission. He said the previous two inquiry commissions had not worked properly. He expressed his anguish that the country could not know the fate of Netaji even after 50 years as there was still controversy about his death. He said documents relating to Netaji should be brought to India from Germany, Russia, the USA and the UK to finally settle the issue. Mr Kaleemudin, Food Minister, West Bengal also demanded that documents relating to Netaji lying in the Russian archives should be presented before the third inquiry commission. Welcoming the delegates, Mr V.P. Saini, Chairman of Netaji Research Foundation and convener of the conference, said the conference was being organised at this juncture to decide plans to present facts to the proposed Netaji inquiry commission. He claimed that the decision to be taken at this conference would be of historical importance. Among others who addressed the inaugural session were Mr Ashok Ghosh, General Secretary, West Bengal unit of the All India Forward Bloc, Major Des Raj Singh from Meerut; Mr Jayant Roy, MP, and Col A.B. Singh (INA) from Bareilly. About 150 delegates from West Bengal, UP, Karnataka, Tamil Nadu, Himachal Pradesh, Haryana, Delhi, Rajasthan, Jammu & Kashmir and Punjab are participating in the conference. The DGP told The Tribune that it seemed that Pakistan had planned large-scale violence in the states of Punjab and Jammu and Kashmir coinciding with the Kargil intrusion to pin down the police and armed forces in the sensitive border areas. The seizure of 28 kg of RDX from a gang of Punjab terrorists belonging to the Babbar Khalsa was smuggled at the behest of the ISI from Jammu border before the Army moved in view of Kargil conflict. He added it was part of a major ISI plan to disrupt peace while its army regulars and mercenaries had occupied snow-bound peaks in the Kargil area. Militant groups, including the Babbar Khalsa, the Khalistan Commando Force and the International Sikh Youth Federation, were under pressure from their masters in the ISI to regroup and launch subversive activities in Punjab during the forthcoming Lok Sabha poll, added the DGP. Mr Sarabjit Singh pointed out that according to intelligence inputs, these terrorist outfits in Pakistan were trying to push in over 400 to 500 militants through the Rajasthan border in the past couple of months but the large-scale deployment of the forces had scuttled their move. The Punjab police was on the alert and strict vigil had been ordered to thwart ISI designs to disrupt smooth electioneering. The DGP has been having a series of meetings at the district-level with senior police officers, including range IGs and DIGs for providing proper security and to maintain law and order during election. Punjab had sought 60 companies of paramilitary forces for the election duty and he had met the Union Home Minister in Delhi last week in this regard. PATIALA, July 24  Mr G.S. Tohra, President, Sarb Hind Shiromani Akali Dal, (SHSAD) said today that the SAD was fielding rich candidates to woo the voters with the lure of money. Speaking at an election rally at Asarpur village in Samana subdivision of the district, Mr Tohra said all hopes of the SAD to secure votes through money would not materialise as the votes were not for purchase. He claimed that the SAD would not win a single seat in the ensuing Lok Sabha elections as there was a move against the present SAD-BJP government in the state. Mr Prem Singh Chandumajra, SHSAD candidate from the local Lok Sabha seat, said Mr Badal had not fulfilled promises made to the public. Neither corruption had been controlled nor any "corrupt ministers of previous governments been punished, he alleged. He called upon the people to vote for SHSAD candidates so that rule of the "common man" against that of "landlords" was set up in the state. It is worthwhile to mention here that work of this drain was lying incomplete for the past 27 years due to various types of hindrances caused by the public. This was stated by the Deputy Commissioner, Dr Roshan Sunkaria, while elaborating on the benefits of desilting of Mehmoodpur drain to media persons recently. Mehmoodpur drain is a stormdrain situated in the bet area on the left side of Bist Doab Canal in Balachaur subdivison, to lower the sub-soil water level and to check floods by channelising the flow of rain water of as many as 13 choes into the Sutlej river. Though the digging was started 27 years ago but it could only be done till RD 33,800 and not up to RD 51,000 as proposed in the original plan due to public hindrances. As the 13 choes crossing the Bist Doab Canal, which flow into plains, have been bringing floods to the area, causing a rise in the sub-soil water level resulting in waterlogging of the area. About 1,650 acres of agricultural land falling in as many as eight villages  Chahal, Aiman, Bir Sarkar, Nangal, Bana, Tonsa, Fatehpur, and Rail have been badly affected due to abandoning of work on the Mehmoodpur drain as, according to an estimate, the farmers of these villages have suffered a heavy loss amounting to Rs 35.64 crore over this period due to floods and water-logging. There was a consistent demand from farmers of the area to complete the work. People were mobilised and motivated to ensure completion of drain. They then agreed to provide land free of cost, the DC said adding that this enabled the administration to start desilting on June 16 and a two-km long stretch of drain had been completed. Work on the 4-km long stretch of the drain would start soon. AMRITSAR, July 24  Ms Kiranjot Kaur, executive member, SGPC, has condemned the section of the Sant Samaj for saying that the new Nanakshahi calendar has been prepared at the behest of anti-Sikh agencies. The allegation confirmed the "hollow" pretensions of the sants trying to gain political and religious mileage in the garb of the Sikh interests, she said. The Gurpurbs were celebrated according to the lunar year in the old Nanakshahi calendar. Since the lunar year is shorter than the natural calendar by 11 days, a correction is applied to the lunar calendar every third or fourth year to keep it in harmony with the natural calendar. Therefore, the dates of the Gurpurbs kept varying every lunar year with reference to the fixed natural calendar. The new Nanakshahi calendar has overcome this problem by converting the lunar calendar to solar calendar. The solar calendar has a difference of only 26 seconds with the natural calendar. The prevalent common era calendar is also based on the solar year. The change from the lunar to the solar calendar is based on hard mathematical calculation, she elaborated. She said rejecting the commendable work done by Mr Pal Singh Purewal and launching a baseless disinformation campaign, makes one wonder if the Gurmat Sidhant Parcharak Samaj understands that the connection to the old Nanakshahi calendar has been applied in light of "Brahmah" in Gurbani. If the Sant Samaj is really worried about division in the Panth it could begin playing a constructive role by enforcing the "rehat maryada" accepted by Akal Takht in its "deras", she said. Meanwhile, the Sri Guru Singh Sabha, in its emergence meeting held under the chiarmanship of Mr Gurdip Singh Bhullar, has rejected the 'Nanakshahi' calendar passed by the Shiromani Gurdwara Prabandhak Committee. The meeting was of the view that the Jathedar, Akal Takht, Giani Puran Singh, had taken a timely decision by banning the implementation of the calendar which could divide the Panth. Patiala Deputy Commissioner Jasbir Singh Bir said the water level was registered at 753.1 feet at Khanauri today. He, however, said the situation was under control as timely cleaning of the syphon before the monsoon had ensured the regular flow of water and bundhs raised on both sides of the Ghaggar in the district had prevented water from flooding agricultural land. He said a constant vigil was being maintained in Gurunanakpura, Kangthala, Matauli, Tejpur, Sagra, Chicherwal and Rasoli which were traditionally endangered by floods. Meanwhile Mr Bir said the Kurukshetra Deputy Commissioner had informed that the Haryana Government had released 2,000 cusecs of water from the Bibipur Lake into Sagra. To maintain its level at 810 feet, he said he had, however, been informed that the Bibipur Lake was still two metres short of its filling capacity and it could take water in case of an emergency. The Deputy Commissioner said the Kurukshetra district authorities had conveyed they would not release more water from the lake. He said around 5,000 cusecs of water from the SYL canal was flowing into the Bibipur Lake due to a breach which had occurred in Pachisdara nullah. He said water from this nullah had entered the SYL canal. He said there was no danger of SYL water flooding land in Punjab. A wireless set had been installed at the super passage adjoining the SYL canal where the Pachisdara crossed the Narwana main line to monitor the situation. This was announced by the SSP, Mr Kuldeep Singh, while addressing a press conference here today, Murli son of Ganesh, was kidnapped on his way back home from his school in Jagatpuri, Haibowal. He was kidnapped reportedly by persons known to him. The kidnapping was allegedly executed by Ramesh Kumar, Prakash, Ram Dayal and Sripal. While the first two worked as painters on contract basis, Ramdayal and Sripal worked as farm labourers. The four had come in contact with the boy's father, a labour contractor, when they had gone to perform "jagran" in his house. The SSP stated that the main motive behind the kidnapping was to make a quick buck through ransom and demanded Rs 1.5 lakh. The boy was held captive in Moga on the first day. at a tubewell in Gill village for the second day, where Ram Dayal worked as a farm helper. On the last two days he was kept at Manakwal village where Sripal worked as a helper. Mr Kuldeep Singh said the police had swung into action on the day the incident occurred. Monitoring was being done from a place, half-a-kilometre from the house of the victim, with the help of a parallel phone and call line identification facility. According to the notification issued by the Centre Government under the new licence policy each pesticide dealer shall now be required to deposit Rs 500 for selling one type of insecticide instead of Rs 300 being charged as the licence fees for two years. As such each pesticides dealer shall have to deposit the licence fees of Rs 40,000 as each retailer sells at least about 80 types of insecticides during a year for completing the spray schedule on different crops. Mr Satish Kumar Dhingra, president of the local Pesticides Dealers Association and others in a joint statement yesterday criticised the decision of the government and described it as anti-retailers and anti-farmers. The long-term affect of the implementation of the new policy shall be that the prices of insecticides shall shoot up to 25 per cent, added Mr Dhingra. The pesticide dealers threatened to launch an agitation if the new policy was not withdrawn by the government. On the night of July 22, while a police party was posted at an octroi post as part of the Operation Night Dominance, a matador carrying six persons hit the police vehicle and fled when signalled to stop. The police party chased them and when the matador reached the Sutlej bandh in Gari Togra village, it entered the water and got stuck. The persons in the Matador got down and shot at the police party, who in turn returned the fire and apprehended three of the six persons, Kala, Raju and Kalia. The SSP, Mr Kuldeep Singh, said that the interrogation of the three arrested persons had revealed that they belonged to Moga and used to come to Ludhiana for stealing stray pigs and then selling them off at Moga at the rate of Rs 2000 a pig. These persons were wanted by the Moga police in various theft cases. A special team has been formed to nab the remaining suspects. In yet another case, the police has arrested Kuldip Singh, alias Billa, and recovered 650 gm of heroin from him. The suspect used to smuggle heroin from the neighbouring state of Himachal Pradesh and sell it in Ludhiana. A case under Sections 18,61,85 of the NDPS Act has been registered against him. A case was registered against Mrs Lall under Sections 406, 420, 467, 46, 470, 471, 120 (B) on September 10. Earlier, Mrs Amrit Kaur Gill, then Assistant Commissioner (grievances), had conducted an enquiry against Mrs Lall on the complaints of parents and teachers of the school who had alleged that she had committed various acts of corruption, including financial irregularities and embezzlement. The enquiry had been ordered by former Deputy Commissioner Vishawjeet Khanna and its proceeding were confirmed by the S.P. (City). The association alleged that they had now learnt that Mrs Lall had succeeded in influencing the district administration and another enquiry was marked to SDM Patiala in December last, which was conducted ex parte. Consequently, efforts were being made to get the FIR against Mrs Lall cancelled. Hundreds of his supporters had converged on the court premises to express their solidarity with the Sant. When he was brought to the court, his supporters raised anti-government slogans. Later, they took out a procession from the court to the mini secretariat there they again raised slogans and demanded that the Sant be released. The Sant was arrested in connection with a land grab case and under the Wildlife Act. CHANDIGARH, July 24  Mr Amarinder Singh, member, SGPC, has been made in charge of the party office here by the Sarb Hind Shiromani Akali Dal headed by Mr Gurcharan Singh Tohra, according to a press note issued here today by Mr Sukhdev Singh Bhaur, general secretary of the party. PATIALA, July 24  In a show of strength the Shiromani Akali Dal parliamentary candidate, Mr Surjit Singh Rakhra, today held a rally at Bakshiwal village, and claimed that 15 sarpanches had left the Tohra faction and joined the SAD. The sarpanches were given "siropas" and welcomed into the SAD by the Finance Minister, Capt Kanwaljit Singh at a function in the village which was close to the native village of Mr Prem Singh Chandumajra. The Finance Minister, Capt Kanwaljit Singh, said the party had thought it to be fit to start its campaign for the Patiala parliamentary constituency from here to prove that the people of the area were aligned with the SAD. While referring to the Tohra faction, he said it was only creating minor obstacles in the path of victory, adding that the main fight would be between the Congress and the SAD. Earlier the SAD candidate visited Jhil, Alipur, Beran, Chandumajra, Hardaspur, Aujan, Reet Kheri and Daun Kalan villages where he addressed gatherings. JALANDHAR, July 24  The All-India Sikh Student Federation (Gill), while predicting that, the Chief Minister, Mr Parkash Singh Badal, will be removed after the ensuing parliamentary elections, has claimed that a "coup" within the SAD will take place after the results of the elections. The AISSF president, Mr Harminder Singh, said today while briefing the media that the political scenario would completely change after the coming parliamentary elections, with a Haryana-type-coup. AMRITSAR, July 24  Bibi Jagir Kaur, President of the SGPC has appointed Prof Jagtar Singh Birdi as the new Media Director. Prof Virdi, a freelance journalist, has been working for Jalandhar based language papers for the past more than a decade. An MA, M.Phil in Punjabi, he also worked as an ad hoc Punjabi lecturer in a college. BATHINDA, July 24  The Punjab Food Minister, Chiranji Lal Garg, today said that the formation of the government led by Mr Om Parkash Chautala in Haryana had proved that people of that state had rejected the policies of the Congress. Talking to newsmen here, he said by extending support to the Bansi Lal government at first and then withdrawing it had exposed the tendency of the Congress to cheat other political parties for its own vested interests. Congratulating Mr Chautala for taking over the affairs of state for the fourth time, Mr Garg said like Haryana, the BJP and its allies would form governments in other states too. He claimed that the origin of Congress President, Ms Sonia Gandhi, had emerged as a major election issue, adding people would never vote for a foreigner. He condemned the Congress for making the Kargil conflict as poll issue. AMRITSAR, July 24  A meeting of Tarksheel Society Bharat (Regd) held at Republic College, Hallbazar under the presidentship of Dr Rai Jasbir Singh, here today condemned reports in a section of the press regarding the existence of ghosts, demons and spirits by so-called scientists and photographers of Spain. Nobody in the world has proved the existence of ghosts, demons and spirits they said. Mr Sumeet Singh, press secretary of the society appealed to the media to investigate the subject before publishing such news because it spurs blind faith and superstition. The society has exposed several such miracles in the past. JALANDHAR, July 24  The police arrested Chetan Sharma yesterday who had allegedly stabbed to death one person, while seriously wounding another. The Senior Superintendent of Police, Mr Gaurav Yadav, said here today that Chetan Sharma, resident of 149, Lajpat Nagar, here had murdered Narinder Kumar of Sidharath Nagar and seriously injured Sukhwinder Singh of Model Town on July 21. The accused had absconded after committing the crime.